Cook the potatoes (uncovered) along with the thyme and garlic in boiling salted water for approx. 20 mins. until soft, drain, remove the thyme. Add the oil and water. Mash the potatoes with a potato masher or fork, season. Mix the mashed potatoes with the flour and lentils, shape by hand into 8 patties. Heat a dash of oil in a non-stick frying pan. Fry the patties for approx. 4 mins. on each side. Remove from the pan, place in a container for a take-away lunch. Heat a dash of oil in the same pan. Gently fry the chorizo until crispy, drain, place the chorizo and eggs in the container with the patties. 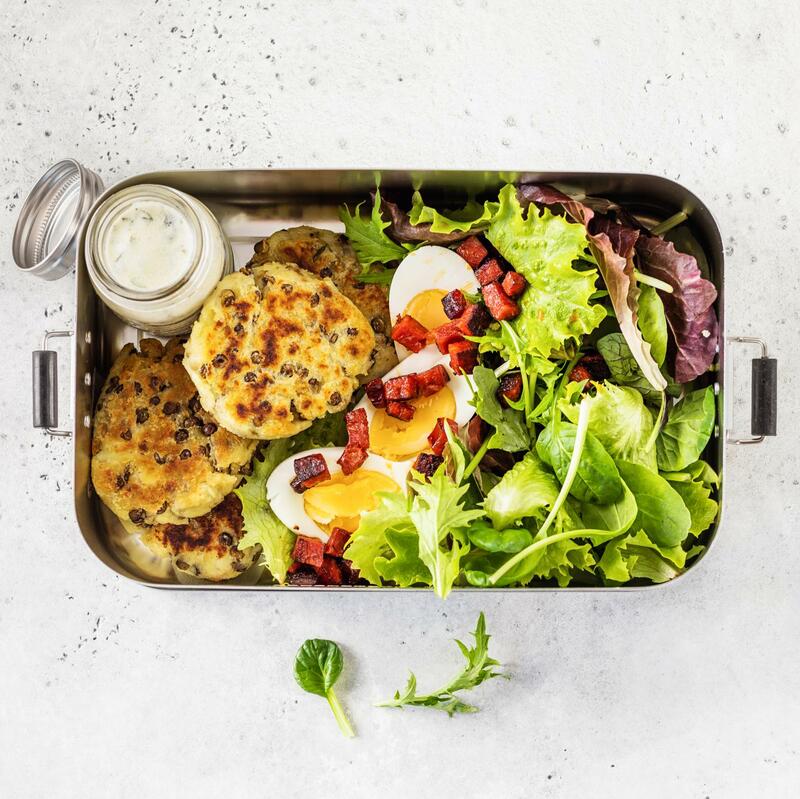 Add the salad, pour the herb dressing into a small container, drizzle over the eggs and salad just before serving. Prepare the mashed potatoes and herb & yoghurt dressing approx. 1 day in advance, cover and keep in the fridge.